At the far west end of Goleta there’s a road that for years only locals knew about. It doesn’t really go anywhere because it ends at a locked gate, but the view is the attraction. Looking back down at the rolling empty hillsides gives you a glimpse into the past of Goleta, back to the days when agriculture was the biggest industry in town. It all started with this guy, Patrick Farren, and this is the only photo of him we can find. Patrick was born in 1842 in Ireland, just a few years before the start of the potato famine, so he must have had a difficult childhood. He came with two of his brothers to the U.S. via San Francisco around 1860 and they went to work as farmers in Northern California. Patrick married his first wife, Mary Kelly, in 1865 and he became a American citizen in 1869. The Federal census for 1870 shows the young couple settled in San Jose and started making babies, the first of which was Michael, or Mack for short. By 1877 they had moved to the Santa Barbara area. Patrick’s two brothers settled in Santa Barbara and Montecito. Patrick found a beautiful spot for his family in the foothills above the Dos Pueblos Ranch and homesteaded it. Little did he know that he and his sons would spend their entire lives there. Patrick and Mary had 6 children, but only 4 survived. They were all boys, Michael,1870, John, 1873, Edward,1875 and William,1879. In 1890, Patrick Farren, along with Isidore Dreyfus, the owner of Eagle Canyon, and other affected parties, filed a petition for the creation of a county road, thus the birth of Farren Road. The name of the road doesn’t appear on the official documents, but it probably eventually got the name Farren Road, because that’s who lived at the end of it! In 1891, Patrick Farren officially filed a Homestead Claim on 160 acres. A homestead was granted to any US citizen willing to settle on and farm up to 160 acres for at least five years, and show evidence of having made improvements. Notice it says here he has 4 children. His son John does not show up on the 1900 census because he passed away in 1899, at only 26 years old, from Tuberculosis. Also in 1891, Patrick Farren appears on the earliest records of the Tecolote School District, so he did do something besides just farming. Of the 3 sons that survived, this was the oldest son, Michael Farren, at 20 years old. He was baptized Catholic and obtained a 4th grade education at the Den School on Dos Pueblos Ranch. He and his brothers followed in their father’s footsteps, working on their homestead claim, and neighboring farms. This was the middle son, Edward, when he was 20 years old. In 1898, gold fever struck the Yukon and some 100,000 would-be prospectors migrated north to chase the dream. On March 30th, 1898, the Los Angeles Times reported Edward Farren of Naples and John Sullivan departed by steamer for the Klondike Country of Alaska. They drove 3 dog sleds with heavy loads 12-15 miles a day headed for Dawson. The trip was very difficult due to bad weather. No more information could be found, but Edward was listed as living in Goleta in the 1900 census, so he must not have stayed up there too long! In 1904, Patrick’s first wife Mary died of pneumonia and was buried at the Calvary Cemetery in Santa Barbara. In 1908, at almost 70 years old, Patrick remarried to Ellen Price who was 20 years younger than him! A few years later, on August 8, 1914, Patrick died on his farm in Goleta from throat cancer. His death certificate is shown above. He was also buried at Calvary Cemetery. His address was listed as Naples, Eagle Canyon. This was the youngest brother, William Farren when he was 31 years old. The census from this year,1910, showed that the 3 brothers lived in a separate house from their parents, but still on the same farm. The brothers show up living together and unmarried on the 1920, 1930 and 1940 census as well. Three eligible bachelors, but evidently, farming was their life. In 1927, Michael Farren received a letter from the United States Government stating he was officially granted ownership of the 160 acre Farren farm. More acreage was added in later years but much of it was overgrown, hilly terrain. The following description of the Farren ranch was written by Jack Woods, a nephew of the Farren brothers that spent many summer days of his youth there in the 1940s and ’50s. “Their house was similar to the classic ranch bunkhouse one might see in the old Western movies. It had two rooms, both small. One room served as the main living area. It contained a large wood stove and plenty of firewood. In the center of this room was a table piled high with old newspapers. The second room was the sleeping quarters. It had several canvas cots placed along the walls, a few wooden chairs and clothing was hung from pegs on the wall. The Farren’s had neither electricity, telephone, or indoor plumbing.” These were some rugged men. This may shed some light on why they never married! What woman would want to live under those conditions? The Farren brothers farmed their property on Farren Road for the extent of their lives. They kept to themselves and weren’t involved in many activities other then their farming. The only firsthand memory of the brothers is from 90 year old Arlene Doty. She remembers as a young girl, in the mid 1930’s, one of the Farren brothers delivered eggs to her parents house in the Ellwood area. Her recollection of the Farren’s appearance was unkempt, like that of a hippie, even though that was way before hippies. Lending credence to our theory that the Farren brothers were hermits, more or less, that really kept to themselves. Clare Theriot found these photos in a box of her grandmother’s photos. They were labeled as “Farren Ranch” and “Martin Family”. This was an amazing revelation for us. Who were all these young girls on the Farren farm? We thought they were lonely hermits! Further research revealed there was a farm hand named Manuel Martin from the Azores that worked and lived on the Farren property for decades. He had several children and these were his kids. The Martin family were shown as living with the Farrens on the census for 1900, 1910 and 1920. So they weren’t as lonely as we thought. These photos were amazing to us because they are the only photos we have seen of the buildings at the Farren farm. Manuel, who is not in any of these photos, was born in the Azores in 1854 and came to the United States in 1873. He married his wife Amelia in 1890 and they had 4 daughters and 2 sons. We found out that lots of Portuguese went to Hawaii in the mid 1800’s to work in the sugar cane fields. They soon tired of the abuse they endured from the Hawaiians, and thousands of them flocked to Northern California. America welcomed them as farm labor because of their strong work ethic. Manuel landed in San Francisco, so he probably came by way of Hawaii. William Farren was born on October 11th, 1879 and died August 8th, 1946. He was the youngest of the Farren brothers, and the first to die. His cause of death was heart disease. The total for the burial was $344.33 and Michael Farren paid $75. Someone else picked up the difference of $269.33, but it’s hard to make out the name. That makes us think Mike Farren didn’t have a lot of money at this time…. Edward Farren, the middle son, died August 10th, 1955, not long after his big brother left the farm and went into the hospital. His cause of death was listed as a heart attack, but it may have been a broken heart. Like so many farmers, Michael Farren was land rich and cash poor. Unable to pay for his lengthy stay at St. Francis Hospital, he had no other choice than to surrender the family farm to pay for his health care. The same farm that his mother and father homesteaded, and the same farm he and his brothers grew up on and worked on for their entire lives. Shortly before his death, the hospital auctioned it off. 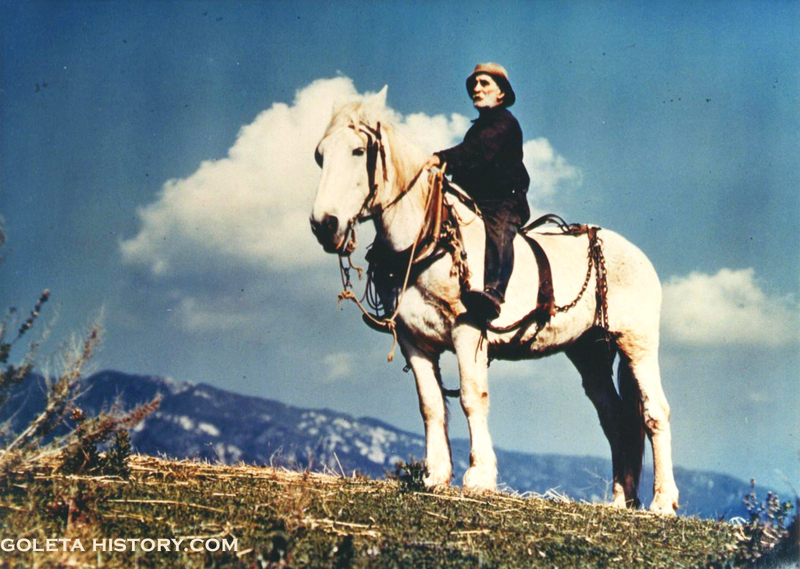 In January 1956, St. Francis Hospital put the ranch up for public auction. Only 3 people showed up for the auction. One was Eldon Haskell and another was Jim Freeman who owned the Refugio Ranch. Freeman was a friend of Haskell’s and he said he wouldn’t bid against him at auction. Just like our mountains after a wildfire, the Farren farm was soon reborn. The Haskell family hauled in an old salvaged house which became the new ranch house. They cut new roads, built reservoirs, put up barbed wire fences and started running cattle. This was the dawn of a new era, and thanks to Eldon winning that auction, one of our favorite beaches soon got the name it still has today, Haskells beach. The Haskells owned the Condor Ridge Ranch until the mid 1970’s. Michael Farren passed away on February 5th, 1960. He was the first born of Irish immigrants Patrick and Mary, and the last Farren son to die. He lived at St. Francis Hospital for 6 years before joining his brothers on the new family farm in heaven. So if you find yourself on Farren Road, give the Farren family a thought. They loved their little slice of paradise so much they spent their entire lives up there. And if they hadn’t homesteaded up there, this beautiful road probably would not exist. Sources: Alrene Doty, Judy Ensign, History.com, Walker Tompkins, Getty Images, Washington Historical Society, Newspapers.com, My pet chicken.com. Special thanks to John (Jack) James Woods, John Woods, Ancestory.com, Dorothy Oksner, Kristin Ingalls, Helen Rydell, Santa Barbara County Genealogical Society, Michael Haskell, Patty Hateley, Santa Barbara Historical Museum, Kathleen Brewster, Michael Redmon, Clare Theriot. Tom – Great article. But, I think my parents sold the ranch earlier than 1980. My brother, Mike Haskell, asked me to look through my collection of family photos for pics of the ranch and, unfortunately, I don’t have any. This is a special post and one I’ll keep and re-read now and then. Thanks to all for the great research and fascinating history. Wondered if the Goleta Valley Historical Society has any recordings related to this as they were taping those of early ranchers for a while. Please keep me on the email list! You got it Bonnie, thanks! Tom – I have 3 pictures that were in my great grandmother’s photo album that say “Farren Ranch- 1910 and 1912” , then lists the the people in it as the Martin Family – a bunch of young girls…. I looked on the 1900, 1910 and 1920 census and there was a family from the azores that were working on the Farren Ranch – Manuel Martin, his 4 daughters, wife and 2 sons.